Topaz is a silicate mineral. 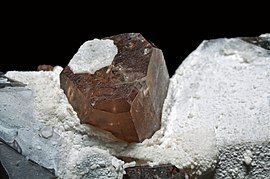 Along with silicate, it includes the chemical elements aluminium and fluorine with the chemical formula Al2SiO4(F,OH)2. Pure topaz is colorless and transparent but they usually have colors made by small impurities. The typical topaz is wine, yellow, pale gray, reddish-orange, or blue brown. It can also be made white, pale green, blue, gold, or pink (rare). Imperial topaz is yellow, pink (rare, if natural) or pink-orange. Some imperial topaz stones can fade if they are exposed too much in the sunlight. Blue topaz is the US state Texas' gemstone. Mystic topaz is colorless topaz which has been artificially coated, making it rainbow-colored. Facet Cut Topaz Gemstones in various colors, including mystic. ↑ Topaz. Handbook of Mineralogy. (PDF) . Retrieved on 2011-10-29.